We’d love your help. Let us know what’s wrong with this preview of Hundreds and Thousands by Emily Carr. To ask other readers questions about Hundreds and Thousands, please sign up. 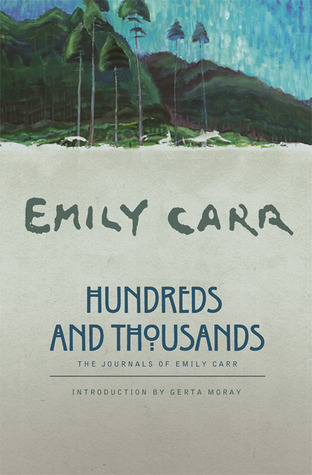 I loved this book, more so than any of the other books I've read about or by Emily Carr because in this book she talks about her painting process and her intensely spiritual motivation when painting...she is also such an amazingly honest and forthright person, someone I would have loved to meet. As I read I look up the painting she is discussing at any given section so it is slow reading for me but very worthwhile. I wish I could afford to buy the illustrated version of this book. I bought this first edition hard cover in Toronto, I believe. I kind of shudder to myself to think that YES, I marked it up. Fortunately, I am not a book collector in that sense of the word. This was her "private journal" and through reading it, it was like she was alive and I got to know her personally, I got to know things which made me ashamed to know at times ( I just had to think of my own journal and I bought this first edition hard cover in Toronto, I believe. I kind of shudder to myself to think that YES, I marked it up. Fortunately, I am not a book collector in that sense of the word. It's a journey. She struggles and persists in her efforts to express pure spirit, 'God' she calls it. What an inspirational woman. And what a pleasure to be able to read her journals, chronicles of everyday things, deeper thoughts, relationships, reactions to critique, inspiration from others. She writes so precisely, peeling things back. I found reading this book comforting because it relates to how I feel about the local environment growing up in BC. I would strongly recommend this book. I read this to prepare a sermon on Carr's painting, "Indian Church." Her work is controversial, of course, for its cultural appropriation of First Nations art and iconography. I get that. Still, her journals reveal a very human, very earnest, very likeable person. I've not read journals before--but this was very interesting. I had to struggle to get through this book. There's only so much you can read about rain, mud, and camping before you get bored stiff. It's true that Emily Carr had to struggle as an artist - most artists do. It gets a bit tedious reading about the struggles on page after page after page. I enjoyed her other books much better.